I had the great honor and pleasure of sharing 4 workshops on pollen this past weekend with artist and author, Lori Weidenhammer. Lori gave me a copy of her new book, Victory Gardens for Bees, which I was thrilled to share with workshop participants. This beautiful and timely book will be on the shelves very soon. It is a fantastic compendium of gardening information with the express aim of helping our native pollinators. The book is lushly illustrated with stunning photos, and it is a delight to hear Lori’s voice come through in the text. The free weekend workshops Lori and I facilitated were offered through Artstarts at the New Westminster Quay location and at Artstarts downtown Vancouver. 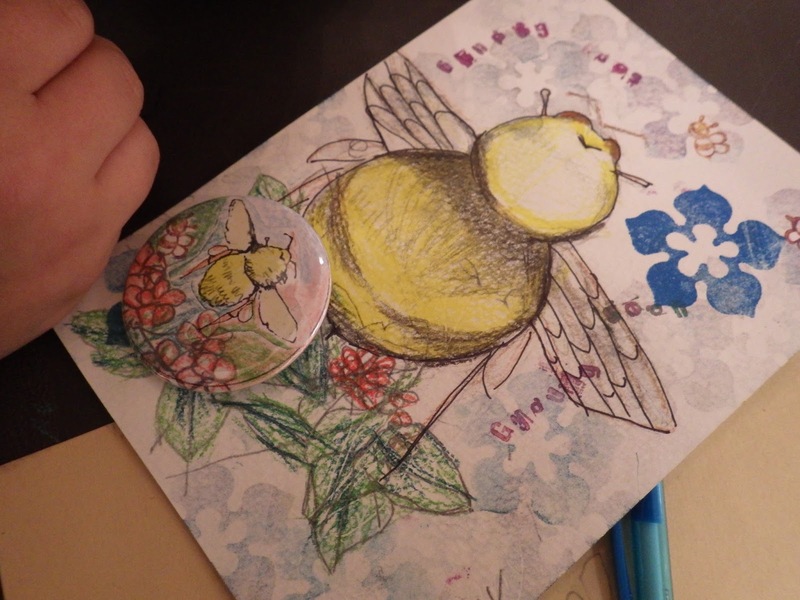 We drew, stamped, collaged and embellished bees and flowers and made postcards and matching buttons. 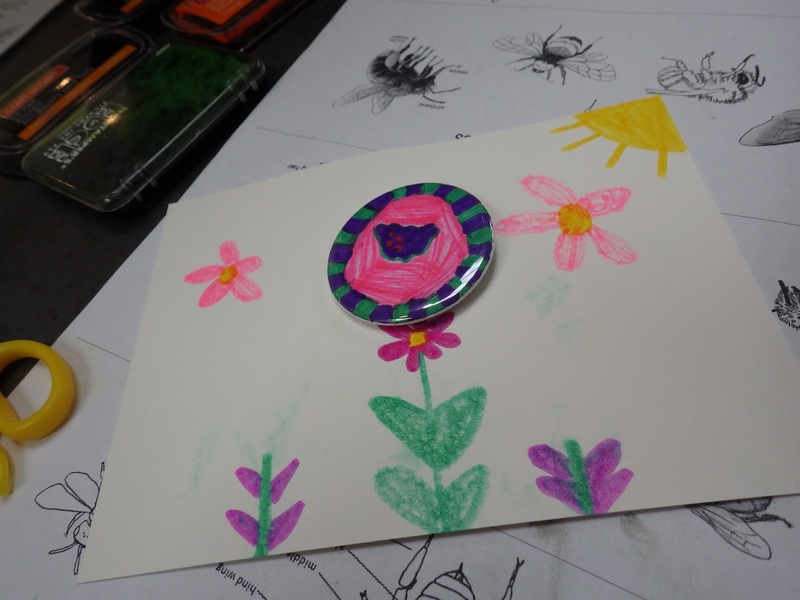 Not only did we celebrate flowers, bees and pollen but we even got to celebrate the 20th birthday of ArtStarts four times!!!! Vernissage! A great evening at the Richmond Art Gallery with the opening of two exhibitions, Cameron Cartiere’s and mine. We heard a beautiful performance by members of the renowned musica intima ensemble. The music was amazing, such gorgeous voices, and Jacob Gramit’s arrangement of Charles Butler’s madrigal was perfect. A very cool section of the madrigal was the recreation of bee sounds for 4 voices! Thank you Caitlin Beaupre, Melanie Adams, Taka Shimojima and Alvin Carpintero for sharing this evening with us. 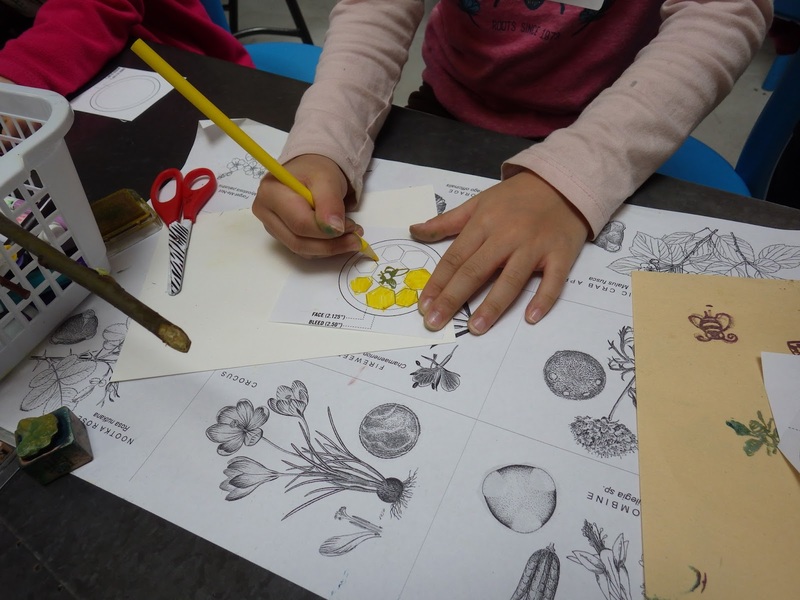 This weekend, the Richmond Art Gallery and the Richmond Art Centre are presenting two days of Bee culture: Buzzworthy! 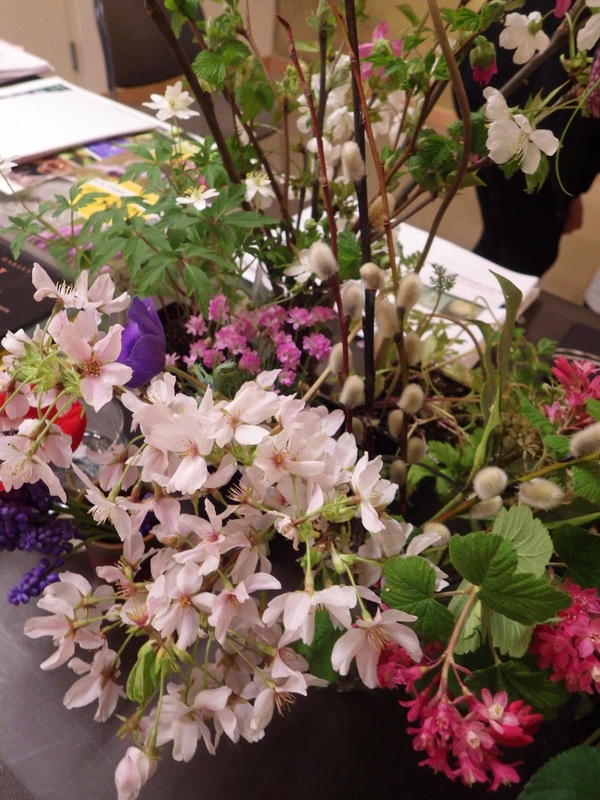 On Saturday there will be a super variety of fun and interesting workshops for visitors to participate in. 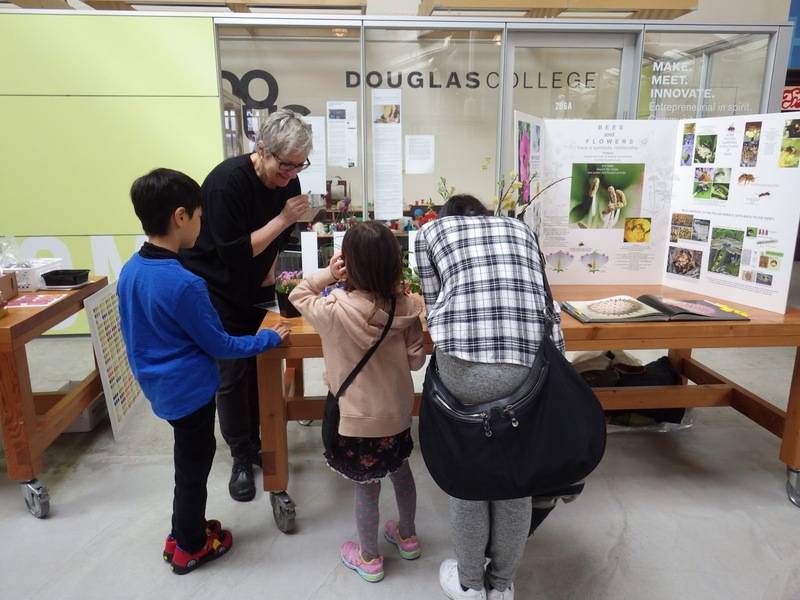 Just to mention a few: my bee buddy, Madame BeeSpeaker, Lori Weidenhammer, will be giving visitors tips on how to plant a pollinator garden in their backyard. Don’t miss that one. Lori is amazing! 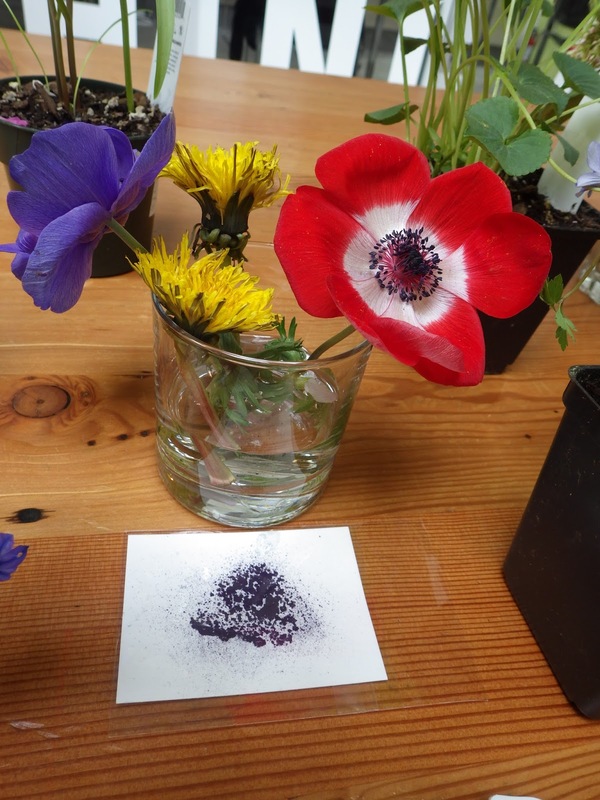 Master bee-keeper and all-around bee and garden expert, Brian Campbell and I will be presenting a pollen-based art-making workshop for visitors of all ages. On Sunday, the RAG is presenting a screening of the superb documentary on bees, “More than honey,” followed by a discussion led by Brian Campbell. (Yes, he gets around!). September marks a special month for me—the project I have been working on for almost 3 years is on display at the Richmond Art Gallery. (The exhibition opens on September 12th). Well, about 2/3 of the entire project has been installed for this exhibition. It climbs 16′ in height, and we have placed a few pieces on the floor, not many, just to indicate that the work continues and the installation is partial. I am most grateful to the curator of the RAG, Nan Capogna. She’s wonderful to work with. She’s very knowledgeable, she’s got a keen eye, she’s considerate yet honest with her comments and critiques. It is a privilege to work with someone of her caliber. The Preparators at the gallery are also fantastic–sensitive, very capable and efficient. Thank god they know how to do math and grids! Kathy, Hilary, Melanie and Paula, part of Nan’s educational, administrative and curatorial team at the gallery are super to work with too. What a great group, and what a great experience this installation has been. 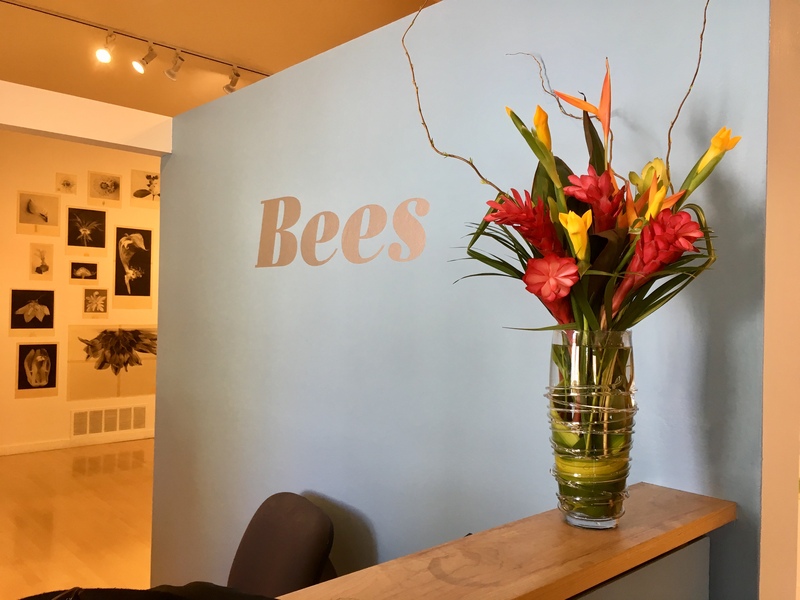 I’m sharing the exhibition space with an artist from Vancouver, Cameron Cartiere, and although we are thematically connected–we are both exploring the subject of bees–our approaches, perspectives and modes of execution are different. Cameron’s installation is stunning. Installing almost to the rafters with Darius! Detail of installation. Photo by Scott Massey. I’m reading a book called Buzz: urban beekeeping and the power of the bee, by Lisa Moore and Mary Kosut (2013). The authors read the practices of beekeeping through a sociological lens, and call their study an “api-ethnography.” Yes, they have a sense of humour–bees can’t be interviewed or participate in the same way that human research subjects can, but the authors created their own research strategies to successfully manoeuver through the social territory of the honeybee. 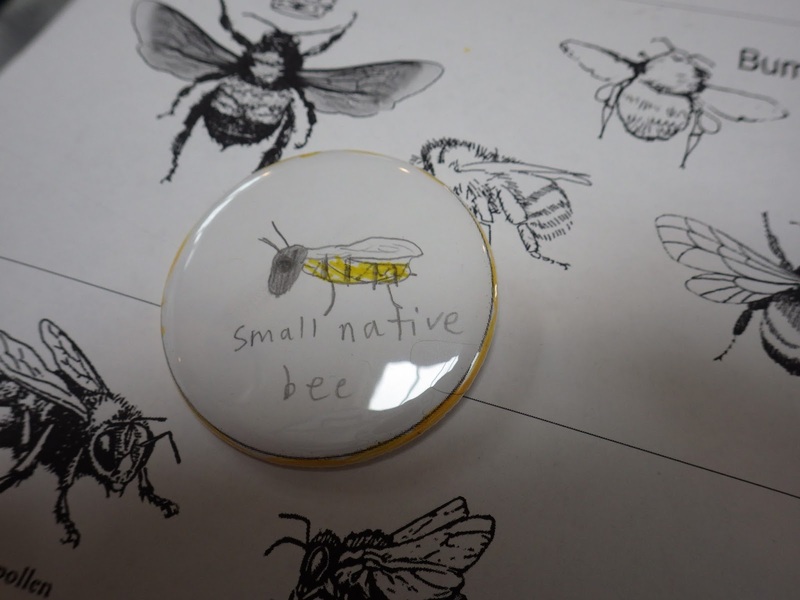 One major area of exploration for the authors is our tendency to anthropomorphize honeybees–they are “cute and fuzzy” and lend themselves to cartoon-like renditions rather easily. These characterizations make bees less threatening and more accessible, but we also load heavier baggage onto bees: “Bees are described as industrious (“busy as a bee”), helpful, driven, purposeful, cooperative and smart.” (p.126) Certainly these attributions reflect our cultural expectations and values, and perhaps tell us more about ourselves than they really do about bees. When I read the above passage, I recalled a similar description in Charles Butler’s book of 1609, The Feminine Monarchie. Last year, I used Butler’s bee proverbs in an art piece; I was so taken by his charming collection of phrases. Interestingly, Butler’s descriptions of bees are: profitable, laborious and loyal, swift, bold, cunning…” We haven’t changed that much apparently since the 1600’s in our relationship to bees, or at the very least, in our descriptions of them. I haven’t been very diligent in posting updates on the progress of my big project on bees, (entitled “not by chance alone”) for the most part because it is difficult to share the endless bouts of self-doubt, but also because the documentation that I have been doing (consistently) has produced iffy photos often taken under poor lighting conditions. Stitching together images of varying exposures is tedious. .A couple of months ago, I decided that I really needed to lay the entire project out to see how the parts fit together and to give me a better idea how to proceed towards completion. It would be the first time I would see the entire project together. 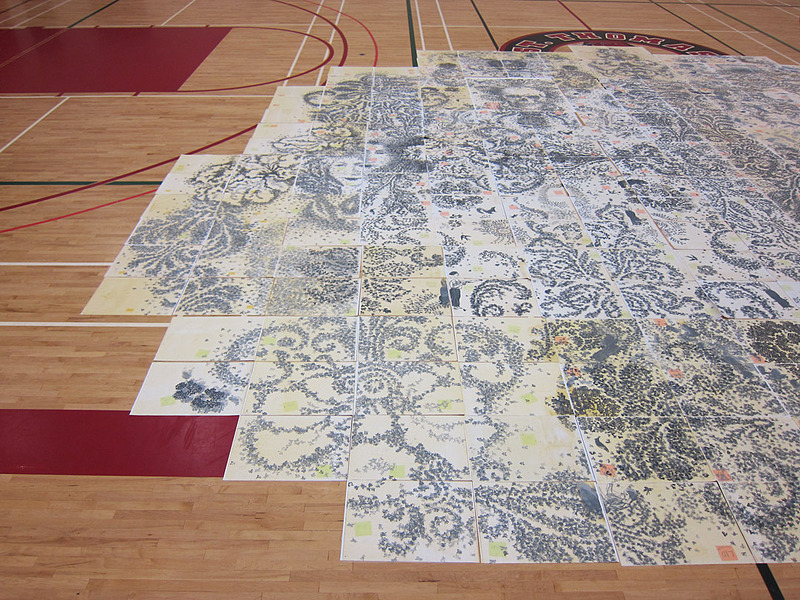 My friend, the artist Elizabeth MacKenzie, helped me with the huge undertaking of putting together the 300 or so puzzle-like sheets that I had completed. I got permission to use the gym at my partner’s school (the administration and staff were very kind to allow me the freedom to do this). Sitting on the bleachers and working from a master diagram, Elizabeth would yell out the number and letter code of each sheet and give me directions where to lay a particular section. 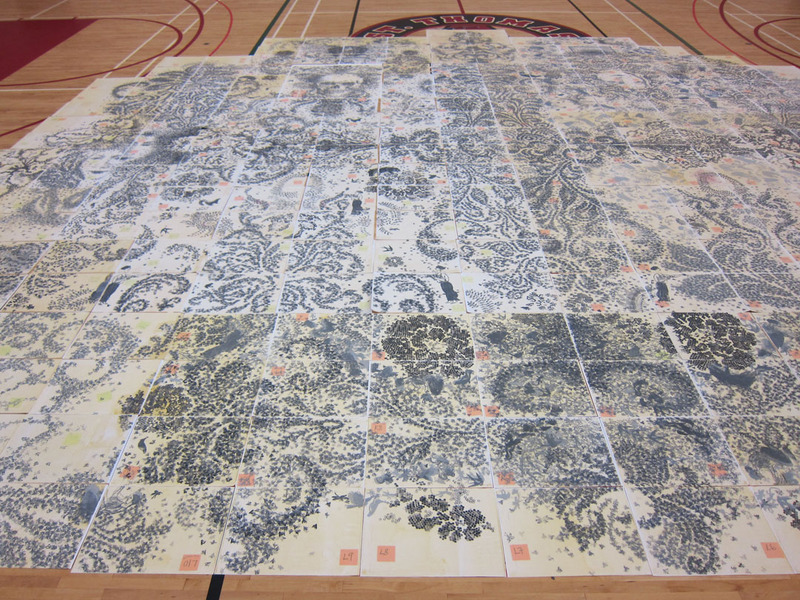 Here’s s shot of the “installation’ – it really does help to show the scale of the work. Elizabeth was also the official photographer for this session, so I am very grateful to her for the images, her GPS and puzzle-making skills (:-) and the wealth of knowledge and experience in art-making which she so generously shares with me! We still weren’t able to get the complete piece in one shot without massive distortion, so here are sections of the work: this one is the left side. 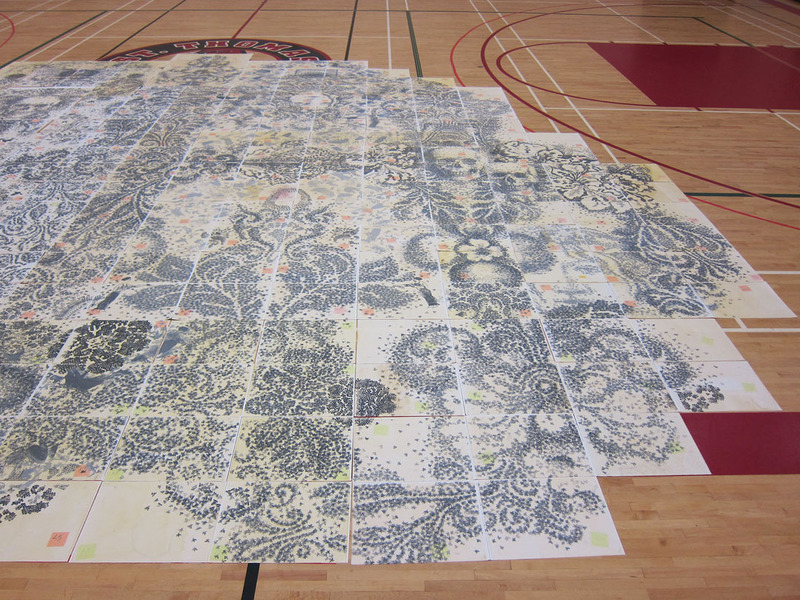 Last Saturday was a super drawing day in Vancouver. 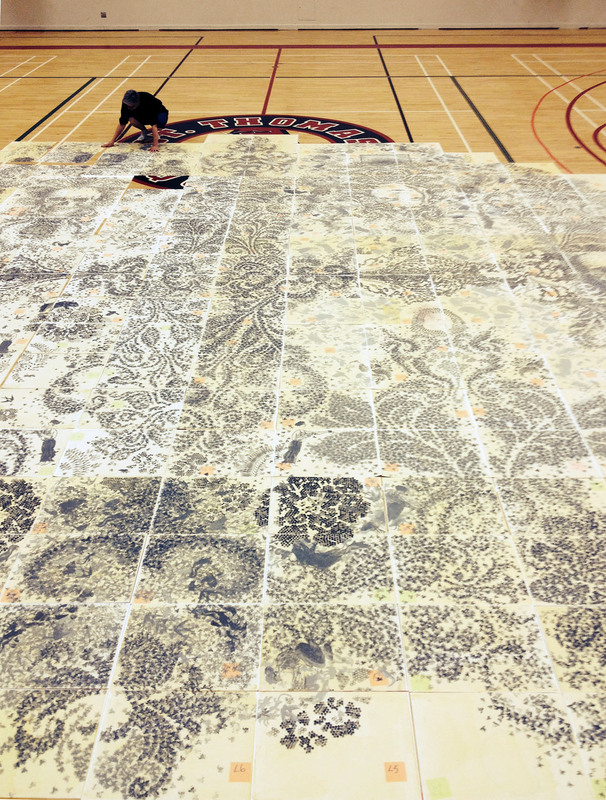 Thank you to the DrawDown organizers, to Cyndy Chwelos, Gary Cho, and the Vancouver Parks Board for creating this event; to my student volunteers who helped to facilitate the art making at Creekside Community Centre, and most of all, to the wonderful, talented participants who created stunning designs for the mandala! Even the weather cooperated (well, somewhat). 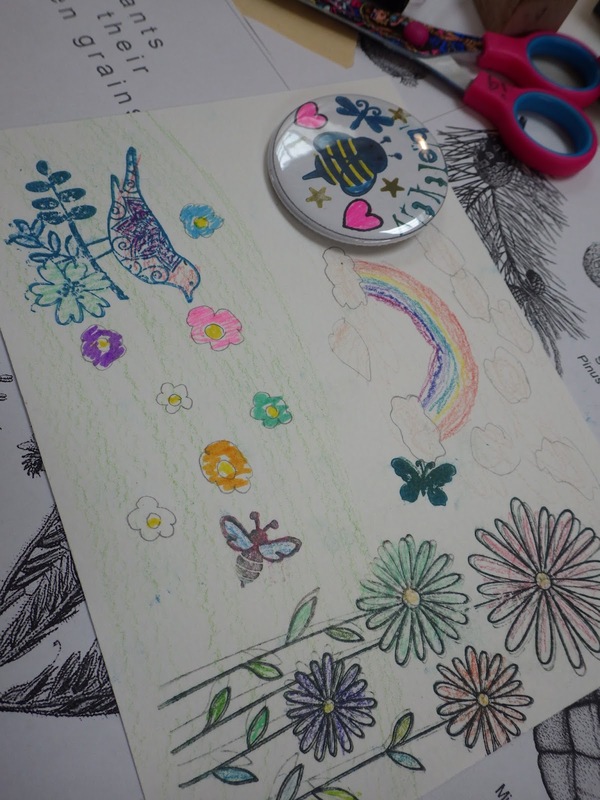 We had some fantastic visitors to the workshop – some very young participants indeed, everyone happy to try out the felts and stamps. 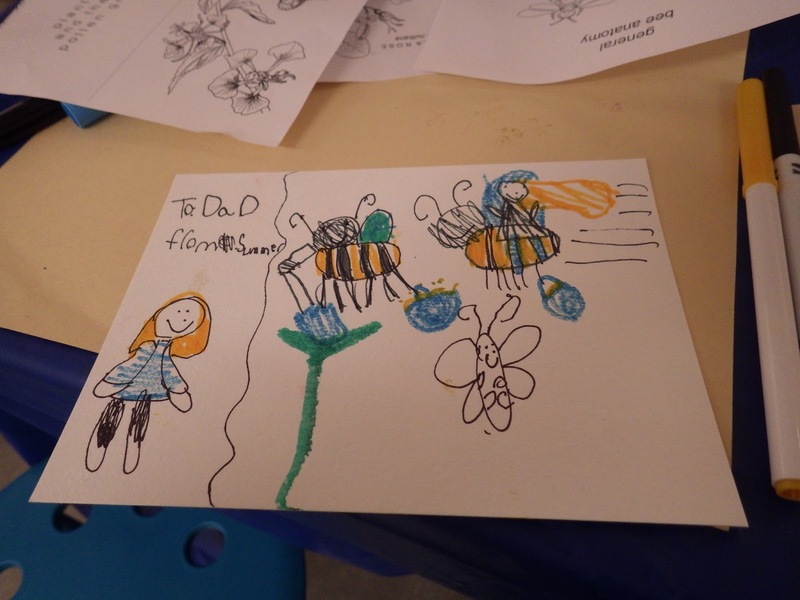 There were bees and printing ink and flowers on the drawing paper, but also on hands and clothes and other places! Hey, whoever said you have to stick to paper only, eh? The designs were very beautiful and each one unique! We almost managed to finish the entire 40-part mandala, just short a few pieces, but with the sign created by my student volunteers in place, the forager mandala looks super! June 14th, 2014. Big day! 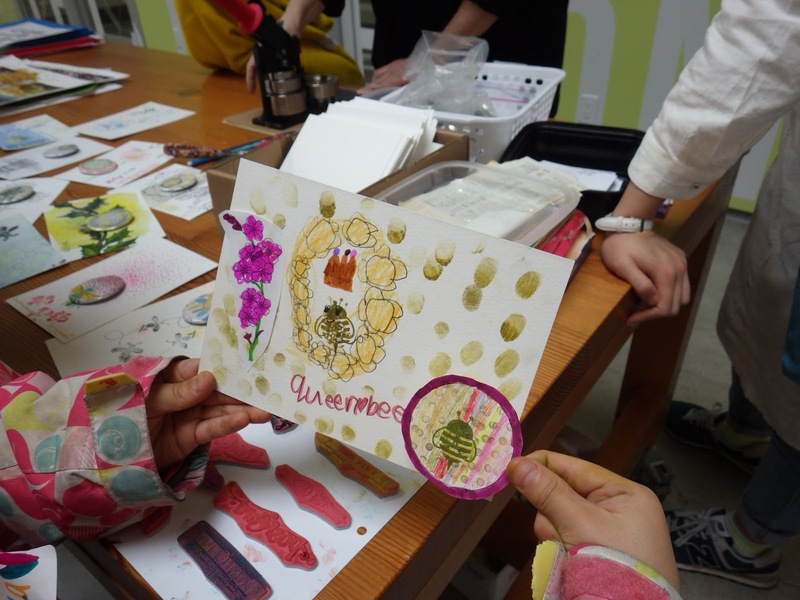 45 free drawing workshops happening all over the city of Vancouver. Fun for every member of the family. Come and join in. Absolutely no experience required. 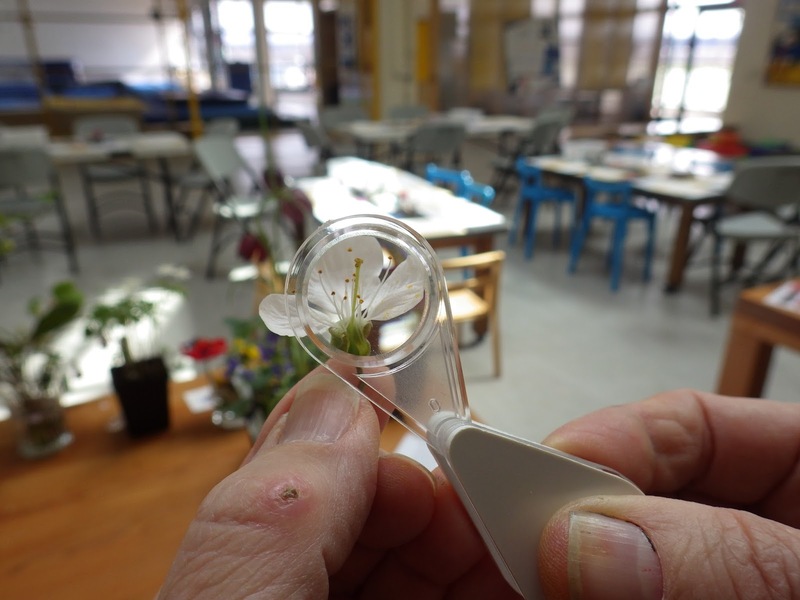 I’ll be doing a workshop at Creekside Community Centre – a collaborative project with all of our art-loving participants, and hopefully 10,000 foraging bees!!!! 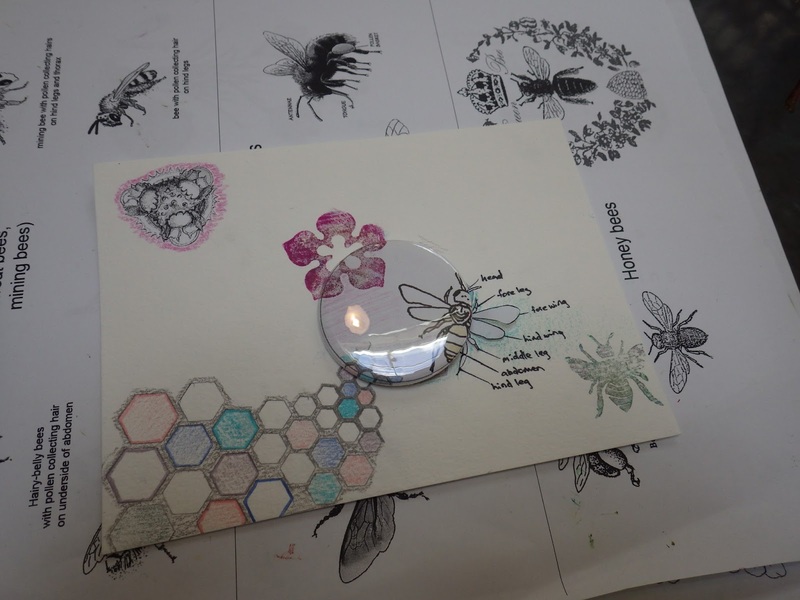 (errrr, not real bees, art bees!!!!). 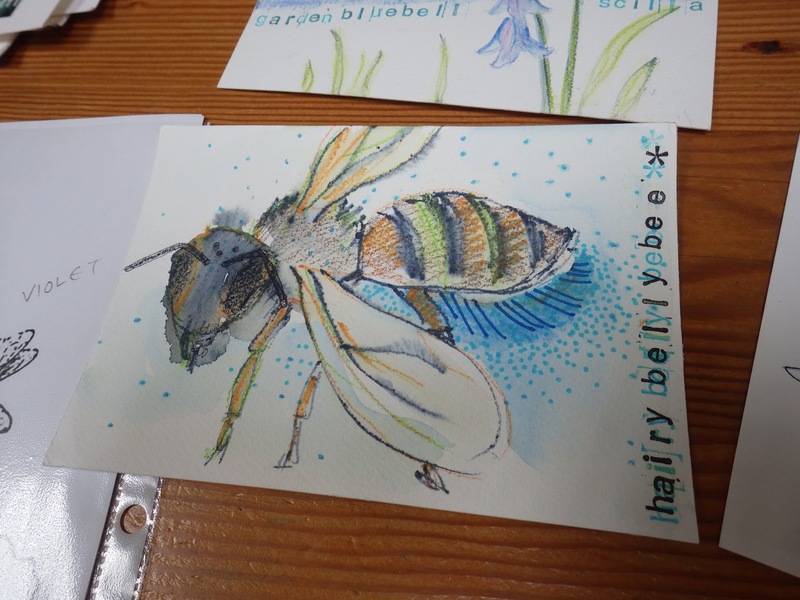 I haven’t been consistent in posting my progress on the large bee project, “not by chance alone.” This is a new section that I have been working on recently. It incorporates one of the large “Flora/Melissa” images. And some close-ups of the smaller figures. 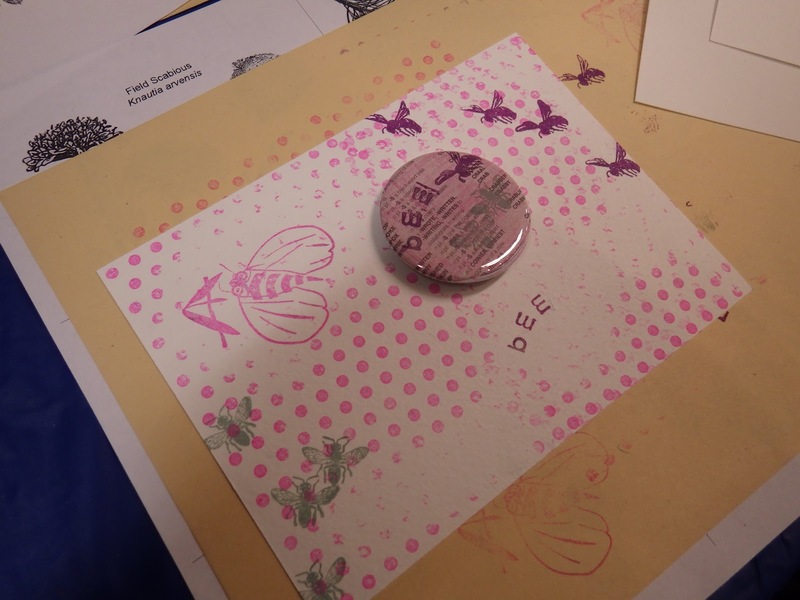 Final image, the paint-covered stamps piled up and ready for washing.